EAST LANSING — Republican Lt. Gov. Brian Calley lodged new accusations against gubernatorial rival Bill Schuette on Thursday, saying the attorney general was personally involved in the transfer of property in the U.S. Virgin Islands while all of his assets were supposed to be in a blind trust. Schuette, who deemed the allegations “false,” said he and his sisters inherited the land when their mother and step-father died. He contended that he has not violated the “spirit” of the blind trust he voluntarily created to avoid conflicts of interest as Michigan’s top law enforcement officer. “It appears as though he’s been directing the purchase and transfer of millions of dollars in offshore assets while attorney general,” Calley said at a forum hosted by the Michigan Press Association. All seven major-party gubernatorial candidates participated in what was likely their only joint appearance. 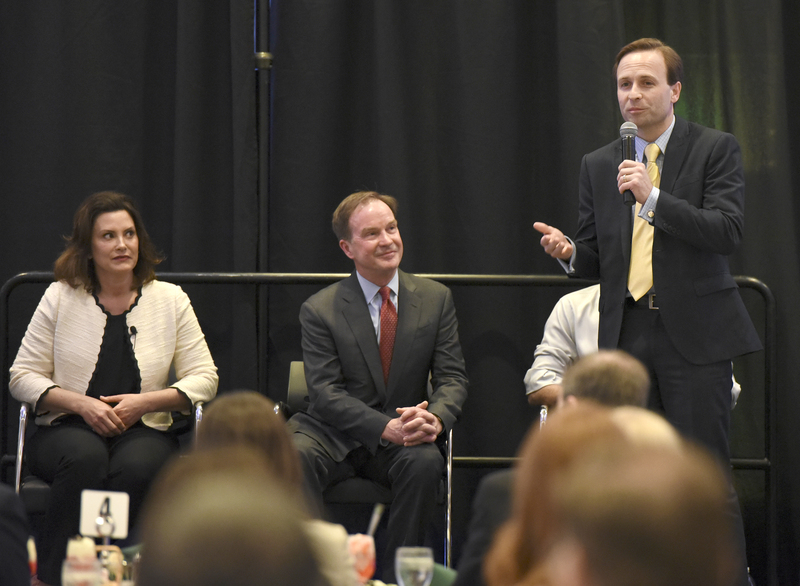 Calley accused Schuette of hypocrisy for not disclosing certain personal financial information like members of Congress must do, which he said he has done even though it is not a requirement under state law. Calley’s campaign released real estate records, signed by Schuette, showing the transfer of three St. John parcels — valued at $3.7 million — between two limited liability companies whose mailing addresses are Schuette’s home in Midland. “What are you hiding?” Calley said. Schuette countered on the stage that the “desperate” Calley’s allegations are “not true. All my assets are in a blind trust. I comply with that fully and completely.” He added that he has released his income tax returns every year since becoming attorney general in 2011 and went on to criticize Calley for raising taxes, supporting “Obamacare” and renouncing his endorsement of Donald Trump in 2016. Later, Schuette’s campaign said he and his sisters own property in the Virgin Islands and Colorado that they inherited, have sold some parcels in transactions that are public and are actively trying to sell more, but Schuette has not bought assets “offshore” as Calley implied. The campaign said the properties, along with Schuette’s main home and cottage in northern Michigan, have never been in the blind trust because they present no conflict of interest.